Back in May 2011 I had shared some photos of a Sleeping Raccoon and of a Raccoon on the Roof that made itself comfortable within viewing distance of our kitchen window. You don’t see raccoons in Calgary ever, so it was a neat opportunity to take some photos of one up-close. 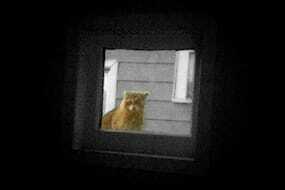 And then since early this year, we had raccoons pestering us in the evenings. They’d never go through our garbage nor make a mess of our green bins though – it seemed like the only thing they wanted was to get into our attic. They’d climb the fence on the side of the house, climb up to a small window off our living room and then get up onto the roof of the house. On more than one occasion while sitting in the living room, we’d look up to the window and see a raccoon staring at us from the window – it wasn’t scared of us and even when we’d walk up to bang on the window, it still sat there, staring back at us! And finally in early March after many noisy, sleepless nights, they finally ripped up enough shingles and made a hole large enough to make their way into the attic. Raccoons are active during the night and sleep during the day, so it was usually early in the morning just before the sun would rise that we’d hear the raccoons forcing their way into the attic. And during the daytime, I’d constantly hear noises in the ceiling – it sounded like the raccoons were shifting positions during sleep and trying to make themselves more comfortable. Our landlord installed a one-way door on the roof so that the raccoons would be able to leave but not come back. They managed to rip it off on one night, but after securing it better we could see that a sticker was missing the next day, which was proof that one of them had left the attic. But we were still hearing noises in the ceiling, so we knew that it wasn’t the only one. Sitting in the office without music on (rare), and what do I hear? 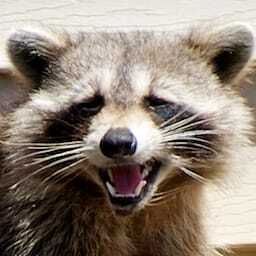 The raccoon in our attic just gave birth to some baby raccoons! I also messaged my brother with the news, and his response was pretty funny: "Wow, lucky! At least someone in that house is having babies!! haha" Hilarious! Anyways, our landlord was already on his way over to resolve our raccoon issue once and for all, (they cause a lot of damage!) but with this new development it meant he’d have to change his plan of action. He called a couple wildlife removal companies but no one was available on such short notice, so we’d have to wait it out for one more night. Michelle had found this video describing the process of removing raccoons from the attic (click that link, it’s really worth watching and not too long either), and it turned out that our landlord called that very same company to remove the raccoons – AAA Gates’ Wildlife Control. The technicians also gave us some very interesting information. First, that the mother raccoon goes searching for a safe place to give birth (like a warm attic) about two weeks before she’s due, and won’t leave even for food so that she doesn’t lose the spot… So it’s very likely that the reason we were losing so much sleep is because the raccoon hadn’t left in two weeks… And the noises we heard? She was probably just chewing up the wood in the attic. At one point, I saw her stick her nose out of the one-way door and I think she could smell her cubs, but was a little scared and unsure of the box on the roof, so she went back inside. And finally at 10:30pm after listening to Michelle worry and obsess about separating the cubs from their mother, we looked up on the roof and could see that the wildlife release box was open. The mother has retrieved her cubs and moved them somewhere safe! The wildlife control guys were just here – they confirmed that the mother raccoon came out of the attic and proceeded to seal up the access hole. How does a mom pick which of her three babies should live? I’ll update again tomorrow or as soon as I know more. The wildlife guys came this morning at around 9:30am. Though we saw the box was open last night at around 7:30pm and thought the mother raccoon had come back to get her babies, the box was "probably opened by the wind" and the two raccoon cubs were still in the box this morning… I didn’t ask if they were still alive, but evidently the mother raccoon decided not to come back for them, and the box is now gone. The end. Baby Raccoons was published on Wednesday, April 10, 2013 at 11:30pm EDT by Daniel Menjívar and last updated on April 11, 2018 at 9:30pm UTC .